Enjoy the rhythm of rolling waves on a beach. Be lulled by rustling leaves. Feel the crackling comfort of a campfire. 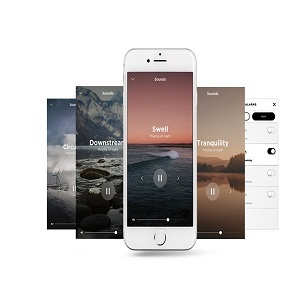 Use the Bose Sleep app to choose from ten preloaded soothing and relaxing sounds that have been specially crafted to deliver the most effective noise masking experience. And because sleep isn’t a ‘one size fits all kind’ of thing, you can use the app to find the volume level that works for you. 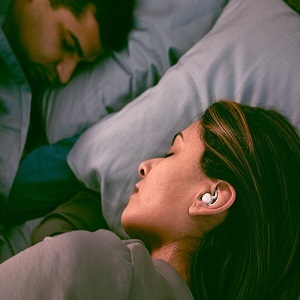 Designed for side sleepers and those who toss and turn, these sleepbuds are built to fit comfortably and securely inside your ear all night. To fit most ear sizes, Bose took several three dimensional scans of ear geometry and used them to create a nodule slightly bigger than a pea. The sleepbuds come with three different sizes of eartips made with soft silicone and designed with a fin that conforms to the upper ridge of your ear. So even if you move around, they’ll stay put for peaceful sleep. While Bose is known for its noise cancelling technology, when it comes to sleep, noise masking is a better solution for annoying sounds (like your partner’s loud snoring). It works because of the way that different sounds combine in your inner ears. If the different sounds have the right match of frequencies and the masking sound is louder than the disturbing sound, your inner ear and brain cannot detect the disturbing sound. It fades from your memory as you drift off to sleep.